Just Genesis : Was Keturah Abraham's Wife? Analysis of the marriage and ascendancy structure of Abraham's Horite people reveals that the rulers had two wives. The first was a half-sister, as was Sarah to Abraham. The second wife was usually a patrilineal cousin, as was Keturah to Abraham. The wives maintained households in separate settlements on a north-south axis. Sarah resided in Hebron, at the northern edge of Abraham's territory in Edom. Keturah, of the royal line of Sheba, resided at Beersheba to the south. Both Hebron and Beersheba were in the territory that the Greeks called Idumea, which is Edom, the land of red people. According to Genesis 25:1, Keturah is described as Abraham’s wife. The word here in Hebrew is ishshah, which means woman or wife. However, according to I Chronicles 1:32, Keturah was Abraham’s concubine. The Hebrew here is piylegesh or piyegesh meaning concubine. Keturah can’t be both a wife and concubine, so which is she? I Chronicles reflects a time long after the events described and is not consistent with the overwhelming evidence that Keturah was a wife. The confusion may be due to the Chronicles' post-exilic reading of Genesis 25:6: "To the sons of his concubines Abraham made grants during his lifetime, sending them away from his son Isaac..." It was the custom to sent away sons who would rule. Abraham was himself one of these sent-away sons. So were Moses and Jacob. Keturah was Abraham's second wife which means that she was his patrilineal cousin who he married at a later age. Analysis of the marriage and ascendency pattern of Abraham’s people makes it clear that Keturah was a wife. Rulers among Abraham’s Kushite people had two wives. The first wife was the wife of the man's youth and his half-sister (as was Sarah to Abraham). The second wife was a patrilineal cousin or niece (as was Keturah to Abraham). The name "Ketu-rah" refers to the Ketu division of the Jebusites. The Jebusites had two main divisions: the Nago-Jebu and the Ketu-Jebu. Of the Ketu-Jebu there is a good deal of information in Genesis. This division resided in Palestine and Arabia. Abraham payed tribute to the Ketu-Jebu priest Melchizedek, who was the ruler of the Jebusite city of Salem (Jerusalem). Ketu-rah was of this division of Jebu, as evidenced by her name. She resided at Beer-Sheba, which took its name from the great patriarch Sheba who controlled the well there. (Beer means well.) Ketu-rah's firstborn son was Joktan, the progentior of the Joktanite clans of Arabia. So the clans of Jebu, Sheba and Joktan are related, but what was their western boundary? It appears from historical records that it was in Nigeria at the confluence of the Niger and Benue rivers which in the time of Abraham's ancestors were very great rivers. Abraham and Keturah are descendants of Sheba, the great grandson of Ham. They are also descendants of Shem, as the lines of Shem and Ham intermarried. Sheba was a contemporary of Eber, Shem's great grandson. Eber’s son Joktan married a daughter of Sheba. We know this because Joktan’s first-born son was named Sheba, after his cousin bride’s father. This naming prerogative of the cousin bride was already a custom in the time of Lamech (Gen. 4). 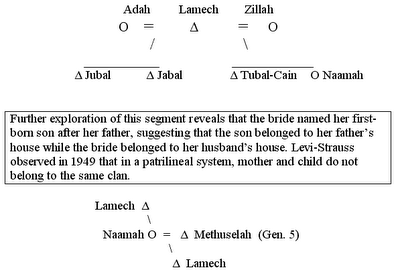 Lamech’s daughter Naamah married her patrilineal cousin Methuselah and named their firstborn son Lamech after her father. Lamech the Younger would ascend to the throne of his maternal grandfather. Keturah likewise named her first-born son Joktan, after her father. So Abraham had two first-born sons by his wives: Isaac and Joktan. He also had firstborn sons by his two concubines Masek and Hagar. By Masek he had Eliezar and by Hagar he had Ishmael. Contrary to common belief, Ishmael was not Abraham's firstborn. The assumption that Keturah was a concubine runs contrary to the biblical information about her relationship to Abraham and her status. Instead, we should recognize that Keturah and Sarah were wives whose firstborns sons would rule over different territories. Hagar and Masek were Abraham's concubines whose subordinate status we can discern from studying Jacob's relationship to Bilhah and Zilpah and the subordinate status of their sons to the firstborn sons of Rachel (Joseph) and Leah (Reu-ben). According to Gen. 10:24-30, Keturah’s father had a brother named Peleg. The text makes much of the implications of Peleg’s name which means “division”, “because it was in his time that the earth was divided” (Gen. 10:25). There are different possible explanations for this division, but the most likely is that expressed in the pattern of genealogical information. The daughter of Sheba who married Joktan and named her firstborn son Sheba is the last bride named of Ham’s line. In this respect she parallels Naamah, the last bride named of Cain’s line. Ketu-rah’s father was Joktan and her paternal uncle was Peleg, who is said to be the “first” son. This means that Joktan, like Abraham, was not to receive the rights of primogeniture by which he would become chief after his father’s death. So Joktan, Abraham’s firstborn by Ketu-rah, would not be chief after his death. That would fall to Isaac, the son of Sarah. Nevertheless the Joktanites would become a powerful presence in the Sinai and by their skills and generosity would enable the Israelites to come out of Egypt and survive in the wilderness. Genesis 10: 26 tells us that Joktan had 13 sons. Almodad appears to be the first-born, as his name is listed first. If Joktan followed the pattern of his fathers, his two wives would have maintained separate households on a north-south axis. This may be the meaning of the sites mentioned in Gen. 10:30: Mesha and Sephar, although “sephar,’ which means “numbering,” might refer to the cosmology of Abraham’s people rather than to a specific location. Some of the descendants of Joktan and Sheba hold an annual autumn feast at an oasis in the wilderness to celebrate the date harvest. This is the one time of the year that women and men may dance together. The date palm (“tamar”) is a symbol of prosperity and fertility. The ‘Id el-Tamar is a festival when the unmarried check out the pool of available matches. As is the custom from time immemorial, wife selection takes place at a well or an oasis. Wells and oases are where boy meets girl in the Bible. There are several incidents of wives being found at wells. Abraham’s servant found Rebecca at a well. Moses met Zipporah, his future wife, at a Midianite well. In none of these stories is the woman a concubine. Keturah could not have been a concubine because Abraham met her at the well of Sheba (Beer-Sheba) according to the pattern of wives. The Horite priests among Abraham's people established their shrines near rivers and wells. They needed the water to sustain their flocks and it was from these flocks and herds that they selected animals to sacrifice. The evidence of the Bible indicates that the rulers among Abaham's people married the daughters of priests. Moses married Zipporah, the daughter of a priest named Jethro. He was of the clan of Midian. Midian was another son born to Abraham by Ketu-rah. Yismael (Ishmael) was Egyptian, since ethnicity was traced through the mother and Hagar was Egyptian. Tracing ethnicity through the mother rather than the father is still required to establish Jewish identity today. This pattern is recognized in Egypt as well, which is why the Egyptian government has made it illegal for Egyptian men to marry Jewish women. (Ke‧tu′rah) [from a root meaning “make sacrificial smoke”]. A wife of Abraham and the mother of six of his sons, Zimran, Jokshan, Medan, Midian, Ishbak, and Shuah, ancestors of various N Arabian peoples dwelling to the S and E of Palestine.—Ge 25:1-4. Keturah is specifically referred to as “Abraham’s concubine” at 1 Chronicles 1:32, and quite apparently she and Hagar are meant at Genesis 25:6, where reference is made to the sons of Abraham’s “concubines.” Keturah was therefore a secondary wife who never attained the same position as Sarah the mother of Isaac, through whom the promised Seed came. (Ge 17:19-21; 21:2, 3, 12; Heb 11:17, 18) While “Abraham gave everything he had to Isaac,” the patriarch gave gifts to the sons of his concubines and then “sent them away from Isaac his son, while he was still alive, eastward, to the land of the East.”—Ge 25:5, 6. It has been contended that Abraham took Keturah as a concubine prior to Sarah’s death, some thinking it improbable that he would have six sons by one woman after he was about 140 years old and that he would then survive to see them attain an age at which he might send them away. However, Abraham lived for more than 35 years after Sarah’s death, dying at the age of 175 years. (Ge 25:7, 8) So he could well have taken Keturah as a wife, had six sons by her, and seen them grow up before he died. Also, it seems proper to consider Abraham’s general regard for Sarah’s feelings, which makes it unlikely that he would risk the possibility of further discord in the household (comparable to that involving Hagar and Ishmael) by taking another concubine during Sarah’s lifetime. The order of events as set forth in the book of Genesis is quite conclusive in indicating that it was after Sarah’s death that Abraham took Keturah as his wife.—Compare Ge 23:1, 2; 24:67; 25:1. It was only because their reproductive powers were miraculously revived that Abraham and Sarah were able to have a son, Isaac, in their old age. (Heb 11:11, 12) Evidently, such restored powers enabled Abraham to become father to six more sons by Keturah when he was even more advanced in age. Olmon, Thanks for your insight comments at Just Genesis on Keturah and Oholibamah. I doubt that Keturah was a concubine, but agree that she was a second wife. This is the pattern of the chiefs among Abraham's people. One wife was a half-sister and the other was a patrilineal cousin. Terah, his father, had 2 wives, and Nahor his grandfather also had 2 wives. Moses had 2 wives, as did Jacob. 1 Chronicles 1:32 was written long after and apparently seeks to reinforce the promise through Sarah's seed exclusively. All counted, Abraham had 8 sons, 9 sons if you count Eliezar of Damascus. Keturah was most likely the daughter of Joktan, Joktan the son of Eber. Considered, as Qahtan, to be the ancestor of the "Pure Arabs". According to the Bible Jokshan was the second son of Abraham and his concubine Keturah, whom he wed after the death of Sarah.Jokshan had five other brothers: Zimran, Medan, Midian, Ishbak and Shuah; as well as two half brothers: Ishmael and Isaac. Midian was the line of Jethro, who's daughter married Moses. Arabs trace their ancestry through their nasab, i.e. patrilineal descent. The Nasrid dynasty claimed direct male-line descent from Sa'd ibn Ubadah, chief of the Banu Khazraj tribe and one of the companions of the Islamic prophet Muhammad.The Banu Khazraj were themselves part of the Qahtanite group of tribes, which originate in the southern regions of the Arabian Peninsula. Yusuf al-Ahmar ibn Muhammad ibn Ahmad ibn Muhammad ibn (Khamees ibn) Nasr ibn Muhammad ibn Nusair ibn Ali ibn Yahya ibn Sa'd ibn Qais ibn Sa'd ibn Ubadah ibn Dulaym ibn Harithah ibn Abi Hazima ibn Tha'labah ibn Tarif ibn al-Khazraj ibn Sa'ida ibn Ka'b ibn al-Khazraj ibn Harithah ibn Tha'labah ibn Amr ibn Amir ibn Harithah ibn Imri' al-Qays ibn Tha'labah ibn Mazin ibn al-Azd ibn al-Ghawth ibn Nabt ibn Malik ibn Zayd ibn Kahlan ibn Saba' ibn Yashjub ibn Ya'rub ibn Qahtan/Joktan b. Aybar b. Shalikh b. Arfakhshad b. Sam b. Nuh. One indication that this should be the correct identification of Qahtan comes from the fact that this Qahtan’s great-grand-daughter Rala bint Mudad was the second and chief wife of Isma‘il, and the matriarch of his line. Her line is Rala bint Mudad b. Amr b. Jurhum/Jerah b. Qahtan/Joktan b. Aybar b. Shalikh b. Arfakhshad b. Sam b. Nuh. So much prejudice,for something so very biblical. Though the Moors tried to protect the Jews as the Moors were Hebrew themselves, the Crusades and the Teutonic knights, and the current Suart Monarchy's have kept this history hidden and misunderstood for over 500 years now. I found this interesting, but I wonder why you link the Moors of North Africa and Spain with the Hebrews. The Moorish period of Spanish history dates from about 711 to 1492 A.D. This is so long after Abraham's Kushite ancestors and so culturally removed that I wonder why connecting them would matter to you? Ke-tu'rah is linked to the priestly office, like Ke-mu-el, a Levite. An earlier Kemuel was the son of Abraham's brother Nahor. Kahlan ibn Saba' ibn Yashjub ibn Ya'rub ibn Qahtan/Joktan b. Aybar b. Shalikh b. Arfakhshad b. Sam b. Nuh. The sons of Arphaxad are: Salah and Eber (from where the name Hebrew is derived). His sons Peleg and Joktan saw the split in the Hebrews. The sons of Joktan were thirteen in number and occupied the entire eastern area of the Arabian peninsular (Gen. 10:21-32) but many went on into Afghanistan or Pakistan, The sons of Abraham through Hagar and some of the sons of Keturah, such as Midian, later joined them. **Joktan, son of Eber. Considered, as Qahtan, to be the ancestor of the "Pure Arabs". The majority of scholars identify Qahtan with the great-great-grandson of Nuh (Noah), the man who has his equivalent named in the Bible list - Qahtan/Yaqtan (Joktan) the son of Aybar/Abir (Eber). In the Biblical genealogy, Eber had two sons – Peleg and Joktan. These correspond to Aybar and his two sons Falikh and Yaqtan (Qahtan). Qahtan/Joktan/Yaqtan b. Aybar had thirteen sons. They are named in the Bible as Almodad, Sheleph, Hazarmaveth, Jerah, Hadoram, Uzal, Diklah, Obal, Abimael, Sheba, Ophir, Havilah and Jobab, and were said to have occupied all the land from Mesha to the hill country of the east. The son Jerah is identified in the Arab tradition with Jurhum. Yarab (Arabic: يعرب‎, also Ya'rab, Yarob, or Yar'ub, or "Yaarub") is an ancient Arabic personal name. Arab and Islamic genealogies identify Yarab as the grandson of Hud (biblical Eber) and son of Qahtan (biblical Joktan), and the ancestor of the Himyarite kings of Yemen. A similar account places Yarab as Qahtan's grandson (Yarab bin Yashjub bin Qahtan) and holds that he is the forefather of al-'Arab al-'Ariba ("the arab arabs" or "pure arabs"), who are generally identified with the Qahtanites and its two main tribes, the Himyar and the Kahlan. Some legendary accounts relate that Yarab was the first to speak Arabic and that the language was named for him. Shams-i Qais Razi, writing in the 12-13th century CE, traced the origins of Arabic poetry to Ya'rab and he is also credited with having invented the Kufic script. Yarob (يعرب) is one of greatest Arab kings, he was the first to rule the entire lands of Yemen (southwestern Arabia). He expelled or destroyed the Adites, consolidated the empire of Yemen, and gave to his brothers Oman and Hadhrarmaut. His son was the king Saba or Sheba, the founder of Saba or Sheba kingdom, mentioned in the Qur'an. Yarob descendants ruled Ancient Yemen for more than a 1000 years, and according to Ibn Manzur's Lisān al-Arab, which was a compendium of classical Arabic philology, he was the only one to speak Arabic on Noah's Arc. Sheba is mentioned several times in the Bible. For instance, in the Table of Nations (Genesis 10:7), Sheba, along with Dedan, is listed as a descendant of Noah's son Ham (as sons of Raamah son of Cush). In Genesis 25:3, Sheba and Dedan are listed as names of sons of Jokshan, son of Abraham. Another Sheba is listed in the Table of Nations (Genesis 10:28) as a son of Joktan, another descendant of Noah's son Shem. Although the Moors came to be identified as Muslim, the name Moor pre-dates Islam. It derives from the small Numidian Kingdom of Maure of the 3rd century BCE in what is now northern central and western part of Algeria and a part of northern Morocco. The name was applied to people of the entire region. "They were called Maurisi by the Greeks", wrote Strabo, "and Mauri by the Romans." During that age, the Maure or Moors were trading partners of Carthage, the independent city state founded by Phoenicians. During the second Punic war between Carthage and Rome, two Moorish Numidian kings took different sides, Syphax with Carthage, Masinissa with the Romans, decisively so at Zama. Why do I link this to the Moors? The lineage starts with the Hebrews of Qahtan/Joktan b. Aybar b. Shalikh b. Arfakhshad b. Sam b. Nuh. This line was persecuted in 1492 Spain. It is told that Zoraya was very beautiful. The emir Abû Al-Hassan `Ali (El viejo) (Muley Hacén) of éprend. It will marry with the beautiful Castilian which will become its favorite. The sultan draws aside his first wife `Â' icha Al-Horra who gave him two wire Mohammed az-Zughbî (Boabdil) and Yûsuf. He expels it of Alhambra to give him the palate of Dar Al-Horra like residence. Abû Al-Hassan `Alî will have also two wire of Zoraya: Nasr and Its `D.
ZORAYA, THE STAR OF THE MORNING. Notwithstanding the deadly rivalship of this youthful sultana with Ayxa la Horra, the virtuous mother of Boabdil, and the disasters to which her ambitious intrigues gave rise, the placable spirit of Boabdil bore her no lasting enmity. After the death of his father he treated her with respect and kindness, and evinced a brotherly feeling toward her sons Cad and Nazar. In the capitulations for the surrender of Granada he took care of her interests, and the possessions which he obtained for her were in his neighborhood in the valleys of the Alpuxarras. Zoraya, however, under the influence of Queen Isabella, returned to the Christian faith, the religion of her infancy, and resumed her Spanish name of Isabella. Her two sons, Cad and Nazar, were baptized under the names of Don Fernando and Don Juan de Granada, and were permitted to take the titles of infantas or princes. They intermarried with noble Spanish families, and the dukes of Granada, resident in Valladolid, are descendants of Don Juan (once Nazar), and preserve to the present day the blazon of their royal ancestor, Muley Abul Hassan, and his motto, Le Galib ile Ala, God alone is conqueror. Descendend of 3 Morrish princes names Cici Haya, Cad, and Nazar who in the vicinity of Granada Spain received Catholic religion and received baptism in the names Pierre Ferdinand De Grenade, and Jean De Grenade. In “Trophees Du Brabant, 1724” by R.P Burkens it is mentioned that amonnd the Lords admitted to the court of Charlequint (Charles V) at Brussells in 1546-1547 is found Jean De Grenade. In this family were also mentioned were Jean and Bernadine-Jerome De Grenade with the spouses, and children. likewise the facts concerning the arms granted to Pierre De Grenade (Cici Haya) are also confirmed “d ‘azure A Cinq Grenades d’ or translated 5 Golden Pomegranits on a field of blue which as also adopted by Nicholas de Grenade 9de0 family notice of 12/6/1548. Sometime between the three Moorish brothers and the families emigration to the Colonies part of the family moved to Palantine State, which is where ancestors are from. Europe in the 1700’s was experiencing war, depression, famine and disease. Religions persecution and widespread oppression of countries accounted for widespread movement into the North American continent. The Palentines acconted for roughly 30,000 emigrants ding Queen Anne’s reign. Baron Christopher de Graffenried led a group of Palentines to go help establish the settlement at New Bern, NC. Yes, there are current descendents of the Kingdom of Granada that were not taken over by the Stuart Monarchy, one man survived, name withheld for protection of his descendents. The ancestral origins of the Stuart/Stewart family are quite obscure—what is known for certain is that they can trace their ancestry back to Alan FitzFlaad, a Breton who came over to the island of Great Britain not long after the Norman conquest. Alan had been the hereditary steward of the Bishop of Dol in the Duchy of Brittany; Alan had a good relationship with the ruling House of Normandy monarch Henry I of England who awarded him with lands in Shropshire. The FitzAlan family quickly established themselves as a prominent Anglo-Norman noble house, with some of its members serving as High Sheriff of Shropshire. It was the great-grandson of Alan named Walter FitzAlan who became the first hereditary High Steward of Scotland, while his brother William's family would go on to become Earls of Arundel. Alan was the son of Flaad, who was in turn a son  of an Alain who had been the crusader (in 1097) who was Dapifer to the Archbishop of Dol, which is situated near Mont-Saint-Michel. "Alan, dapifer" is found as a witness in 1086 to a charter relating to Mezuoit, a cell of St. Florent, near Dol. One who brings meat to the table; hence, in some countries, the official title of the grand master or steward of the king's or a nobleman's household. 7.^ Round (1901) p.122, speculates he may be possibly a brother, with their father also being Alain, and another dapifer. Certainly there are common patterns surrounding royalty. They are NOT like the rest of us. The pattern among the Horite rulers involved double descent by the 2 first-born sons. The first-born son of the cousin wife ascended to his maternal grandfather's throne. The first-born of the sister wife ascended to his fatehr's throne. Among the ancient Horites the pattern was double descent. The kinship pattern of the rulers listed in the Genesis genealogies shows two lines of descent. One is traced through the cousin/niece bride who named her first-born son after her father. Example: Namaah, Lamech the Elder's daughter,(Gen. 4) married her patrilineal cousin Methuselah (Gen. 5) and named their first-born son Lamech. This pattern, which I call the "cousin bride's naming prerogative," is found with the names Joktan, Sheba and Esau, among others. The other line of descent is traced through the first-born son of the half-sister bride, as Sarah was to Abraham. The ruler-priest lines of the two first-born sons intermarried, thus preserving the bloodline of those to whom God made the promise that a woman of their people would bring forth the Seed who would crush the serpent's head and restore Paradise. Many already know quite a bit of the Biblical lineage of the Nasrid dynasty, the line of Joktan and Keturah. I hope for this information to become well known someday. I am working on the lineage myself, and am sad how little many dont care. For instance one in this Nasrid line is: Ziphorah Saffureh and she is “the diviner or prophetess She is Tarikha el Himyari for her mother was a woman of the tribe of Himyar. I know of many others as well in this line. One day the truth will be known. If they were told to go east, where would they end up eventually if not in the Far East would not they? And their numbers have to be numerous by now for Keturah had 7 sons more than Sarah or Hajar. Gen. 25:6 says to the "land of the East." I assume that this corresponds to Gen. 29:1 where we are told that Jacob reached the "Land of the Easterners." That would indicate movement from Arabia to Syria and Mesopotamia. The Kushites did move that direction, but not only that direction. Some clans moved western across central Africa. Keturah had 6 sons but their descendants appear to be Arabian. According to Yoruba oral tradition, Esu was the third king of Ketu. The kingdom of Ketu is in the present-day Republic of Benin and the king is referred to as the Alaketu of Ketu. The first Alaketu is said to have descended from a prince or princess of Okanbi, son of Oduduwa. Another son of Okanbi became the Onisabe of Sabe, also located in Benin Republic. I wish to add, the likely place they (Keturah descendants) would end up have to be in the Malay archipelago from Malaya to Sumatra, from Sumatra to Borneo or Java, and from Borneo to the Philippines and Sulawesi. In these places, gold and incense are in abundant. Biblical Havilah - Land of Gold - is in East Africa. Bor-Nu, another African word, also means land of gold and parallels the word Bor-no, which means Land of Noah. The Moors of North Africa and Spain (711-1492 AD) are a different people than the Jews. This genealogy is fascinating, but you don't provide references for certain things. I have the Torah, the Septuagint, and the Vulgate, and no where do I see anything to indicate that Sarah was Abraham's half-sister, nor that Mesak was his cousin. From where do you get this? In Genesis 20:12 Abraham explains to Abimelech that "indeed she is my sister; she is the daughter of my father, but not the daughter of my mother; and she became my wife." Masek is named in the Septuagint. 1. Grandson of Cush and son of Raamah (Genesis 10:7). 2. Son of Joktan (Genesis 10:28). 3. Grandson of Abraham by Keturah; son of Jokshan (Genesis 25:3). For example, the name of Moses' brother Amran seems to be a conflation of Aaron with Imran, their father. And the Arabic Zarifa seems to combine elements of Moses' Midianite wife Zipporah and his sister Miriam. But we must be grateful for the great care with which these traditions have been handed down for over 3,000 years! For, here we can unmistakably identify the Red Sea Crossing, Moses, the Israelites, their Wanderings, their battle with the Amalekites, and their search for the Promised Land. Indeed the oldest tradition appears to be the King Lists of Genesis 4 and 5 in which we discover the marriage and ascendency pattern of Abraham's Kushite ancestors. if you are in Hebron (Paletine or Israel or Jordan), from where you are standing, you are told to go to the east, can it be Africa? To go to India makes more sense but the peope of India will tell you, to go to further to the Malay archipelago as India is not east enough. Kain was banished to the east. If he originated in the region of Lagos or northern Benin, we are not surpised to find that his territory ran north-south between Kano and Nok. Likewise Abraham's territory ran north-south between Hebron where Sarah lived and Beersheba where Keturah lived. It was the custom of the ancient rulers to place their wives in separate households on a north-south axis. Sent-away sons were to establish their own territories. They moved eastward and northward from their fathers' territories. This marriage and ascendancy pattern drove the Kushite expansion out of Africa. The Kushite rulers came to control a vast Aro-Asiaitic Dominion from the Benue Trough to India, Nepal, Cambodia and even Japan. Some, called Magyar-am, settled in the area known today as Hungary. Some, called Ainu, went to the British Isles and came to eastern Canada through Finland, Greenland and Labrador. The Ainu also settled Japan. Fascinating. A lesson for the Christian scholar is not to dismiss the history of the Islamic world which incorporates the story of Abraham's ancestors and descendants. I learned a great deal in this discussion and am very grateful for your scholarship; both Madame Linsley and anonymous. Thanks, Kevin. It is important to credit all sources that provide significant information in reconstructing a picture of Abraham and his Kushite ancestors. The Kushites were a Nilo-Saharan people and the Nilo-Saharans extended from Benin, Cameroon, Nigeria, Niger, and Chad into the Arabian Peninsula. Thus Ketu-ra, is not an Arabic name meaning perfume, but rather the designation of the line of Abraham's cousin wife. She was of the Ketu of Ra. Likewise Sa-ra was of the Sa-Ra. The qir ka are the eastern Sara, the qin ka are those living in central Chad, and the qel ka are the western groups. The Sara are descendants from an earlier 3-tribe confederation of warriors and kingdom builders. According to legend, there were giants among them. Were these the elohiym (deified rulers) who comprised the divine council spoken of in Genesis? In the wikipaedia entry of Gujarat, in its etymology, it speaks of Gujjars as Sun Worshippers, whose plates bears Emblem of God the Sun. It also said that their origin is unknown. Is possible that they descended from the Horite ruler-priest and through Keturah. Thank you. Concerning Sarah being Abraham's half sister, there are far too many Jewish sources that further describe the nature of the verses you supply from Genesis in greater detail that explain their relationship. In brief Sarah is the daughter of Haran, a half-brother to Abraham. There are many more but this should suffice. These Jewish sources are too late. I am a Biblical Anthropologist. That means I draw the data from the Bible, not the Talmud. The name has various meaning depending on its context. Keturah can refer to perfume, or something fragrant as in incense. It could also indicate that she was related to the Ketu clan of Ra, the Creator. The Ketu-Jebu were one of the ancestral lineage of the Jebusites. Abraham appears to have been related to them. Abraham's priest was Melchizedek, the ruler-priest of Yebu/Jebu/Jerusalem. Keturah was Abraham's patrilineal cousin. Jacob went to the land of easterner, to see his relatives. He met Laban that reminds me of Luban Jawi, Luban = fragrant tree, Jawi = Java island. The marriage culture i.e. elder sibling gets priority to marry before younger one. By etymology "East" in any language always has to do with South East Asia, related to Sunrise, spicy, tree etc. Abraham by Arabic is related to the meaning of to cross, and that connotes with sea more than land or river, doesn't it? Javanese kings genealogy states various legend names, Abraham, Visnu, Sara etc. And Eastern Archipelago is Keturah's sons' lands. DananG TyAswOro, Welcome to JUST GENESIS. Hello, I'm very grateful that you draw the data from the Bible, not the Talmud. Question: What are the origins of the slaves that were brought to American? The Hebrew Israelites claim they are the only physical Jews, and are of a different race than the Africans who are of the seed of Ham? Are there any biblical scriptures available? Most of the Africans brought by slavers to the Americas were from West Africa. Some of these were sold by Africans to Europeans. 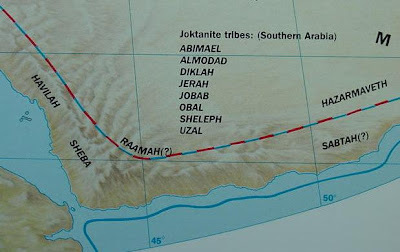 Abraham's ancestors were mainly Nilotes and Proto-Saharans. Some of them migrated to the western side of Africa (Ghana, Niger), but it appears that most migrated back toward the areas of Lake Chad and the Nile River when the Sahara region began to dry out. The Hebrew people intermixed with many different peoples and do not have a pure genetic line. However, the Hebrew priests tended to marry within their own priestly lines so the genetic lines of priests can be traced to Haplogroup R which comes from L.
When you talked about meeting their wives at the well, it popped up in my head that Jesus met a woman at the well and some sources say he was married. Did this never occur to you? Of course I am aware of the fact that Jesus met Photini at Jacob's well. The Orthodox Church considers her "equal to the Apostles." She was the first Christian evangelist and a martyr. She represents the Church, the bride of Christ. If you are attempting to use this narrative to prove that Jesus was married, you have not done so.